The Thinker by Rodin, The thinker, Rodin's thinker. thinker, Rodin, Auguste Rodin. The Rodin Museum, Paris, 1881 A.D.
Of all the works by Rodin, the most famous one is unquestionably the great Thinker. 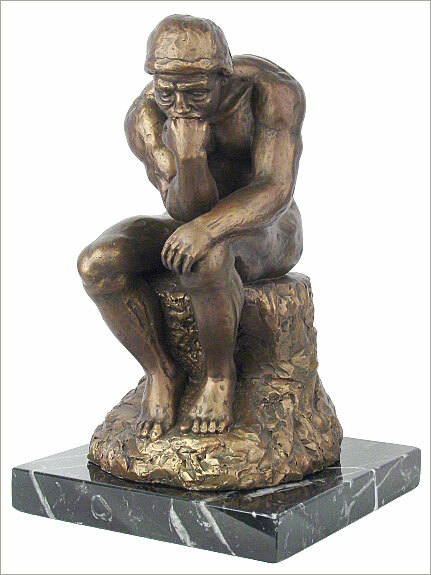 The Thinker was the first work by Rodin to be erected in a public place. The Thinker was modeled in 1880 � 1882 as part of a commission by the Museum of Decorative Arts in Paris to sculpt a monumental door based on The Divine Comedy of Dante called The Gates of Hell. Each of the statues in the piece represented one of the main characters in the epic poem. The Thinker was exhibited in its original size (H. 71.5 cm) in Copenhagen in 1888. It was enlarged in 1902 and exhibited in this form at the Salon of 1904 where it aroused strong reactions from the press during a period of intense political and social crises which turned this sculpture into a socialist symbol. In 1922, using as a pretext that the statue created an obstacle during ceremonies, it was transported, with its pedestal, to the garden of the H�tel Biron which had by then become the Rodin Museum. Another example was placed over the tomb of Rodin in Meudon. Initially named the The Poet, The Thinker statue was intended to represent Dante himself at the top of the door reflecting on the scene below. However, we can speculate that Rodin thought of the figure in broader, more universal terms. The Thinker is depicted as a man in sober meditation battling with a powerful internal struggle. The unique pose with hand to the chin, right elbow to the left knee, and crouching position allows the statue to survey the work with a contemplative feel.